NALC FOOD DRIVE— Western Jurisdiction United Methodist Men’s President Larry Dozier (second from left in the photo) and Gardena Mayor Paul Tanaka (third from left) join Gardena, CA postal employees to remind and encourage Gardenans and citizens across the nation to remember to donate food for the National Association of Letter Carriers’ (NALC) largest one-day food drive May 10. Citizens are being asked to leave a bag of non-perishable food items near their mailboxes before their letter carrier comes by on Saturday. Carriers will pick up the items and deliver them to a nearby food distribution charity within the same community. Dozier said that UMM, through their Meals for Millions program, provide 5.7 million pounds of fresh produce annually to America’s hungry, which results in 28.2 million servings of food. UMM have a goal to eliminate hunger during our life time. “This really complements our ministry,” Dozier said. “We’re asking UMM throughout the jurisdiction and across the nation to support this very worthwhile effort and remind their friends and neighbors.” Last year, letter carriers collected 74.4 million pounds of food. They have collected 1.3 billion pounds since the program started in 1992. 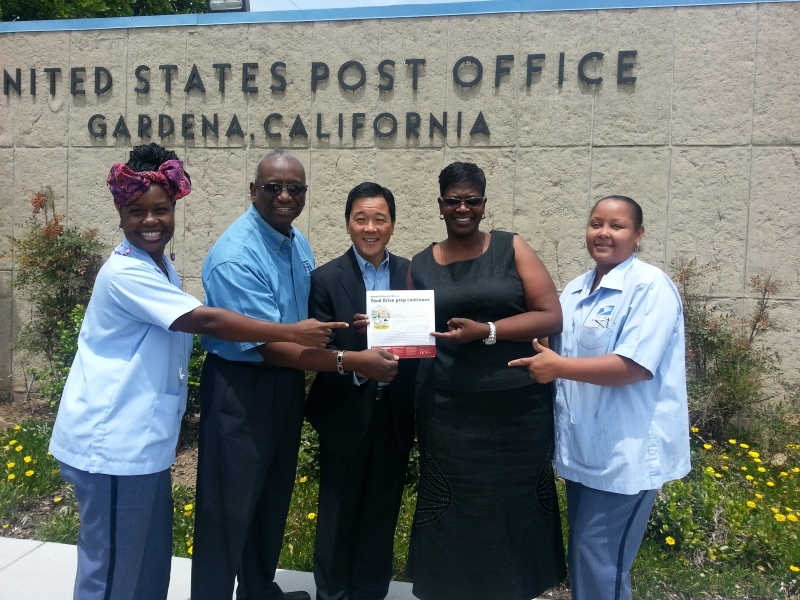 Shown in the photo are (from left) letter carrier Tenesha Henderson, Dozier, Tanaka, Postal Supervisor La Shawn Smith and letter carrier Camella Siler. For more information about the NALC Food Drive, click here.